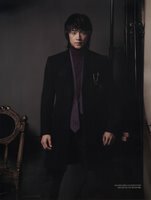 Pan-Asian star Rain has participated in the photo exhibition “Letter from Angels 4” organized by photographer Cho Se-hon to help children without families. In cooperation with the Social Welfare Society (SWS), the exhibition has been held since 2003 to help children living in social facilities find a new home and lead a healthy life. The exhibition will be held at the Insa Art Center in Seoul from Dec. 20 until 26. Other participating stars include actresses Kim Jung-eun, who is a SWS promotion ambassador, Kim Hye-soo, Sohn Ye-jin and group SG Wannabe. doozy: With the release of his fourth album and concert tour, Bi is “everywhere” these days. Good for him that he’s using his star power to promote worthy causes. I like the picture. The way he’s holding the baby looks so gentle. Pan-Asian star Rain will hold a meeting with the 8th U.N. Secretary-General-elect Ban Ki-moon on October 28 in North Chungcheong Province at an event congratulating Ban for his election. Before performing in a congratulatory concert, the singer will meet with Ban for about 20 minutes so the two can thank and congratulate each other on their respective achievements in raising Korea’s status in the international community. Rain, whose fourth album sends a message of world peace, said he will be honored to meet with Ban, whose new post will endow him with the ability to realize the goal of attaining world peace. 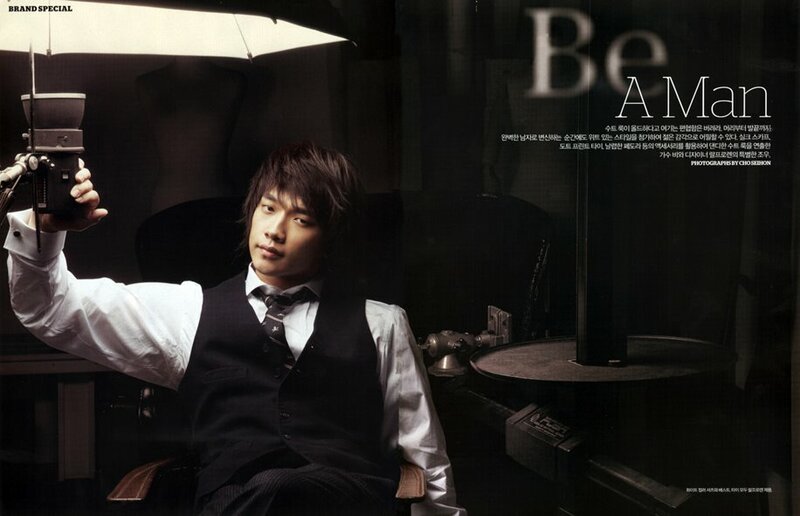 On October 29, Park Jin-young, who is Rain’s producer and the CEO of his agency, will represent Asia at the U.N. Youth Leadership Summit in New York. The meeting between Rain, who in February was selected by the U.S. magazine Time as one of the 100 most influential people in the world, and Ban, who won a unanimous vote to take the post of U.N. secretary general, will represent a ray of hope for Korea’s future. Organized by Gyohyeon Elementary School, Chungju Secondary School and Chungju High School, Ban’s alma maters, and the Chungju municipal government, the event will be attended by some 10,000 Chungjju residents and heads of local government offices. The congratulatory concert will be broadcast live by local cable broadcaster HCN. The pre-recorded version of the concert will go on the air in China, Japan, Taiwan and the Philippines. Special thanks to StiCkiT and suejinners for posting the pictures. I’m gorgeous, I know. My body is a work of art! I love the guitar intro. This is one of my most favorite songs. Japan, are you ready? Here I come! Special thanks to Lanice for uploading the MVs and subbing teams for the subtitles. Weather forecast: Rain in the USA? 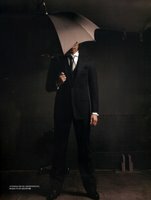 Rain is going to release his 5th album (World Wide version) in the 2nd half of 2007, mainly targeting at USA and the rest of the world. According to Rain’s recent interview by Starnews, “5th album will be released next year as world wide version, as it’s part of the plan to enter USA market…” “Mini concerts will be held to release of new songs, and combined with World Wide…. The event(s) shall be organised in S. Korea and other countries…” Rain added, “The initial stage of brain-storming for 5th album was completed..” So let’s look forward to it. Rain also mentioned that this album mainly includes English songs so that it can be simultaneously released in S. Korea and overseas markets. It is a totally different concept compared to License Album. “Like what I normally did in the past: Conceptualization for 4th album was done during the release of 3rd album… Therefore we have the ideas for next album after the release of 4th album.” said Rain. 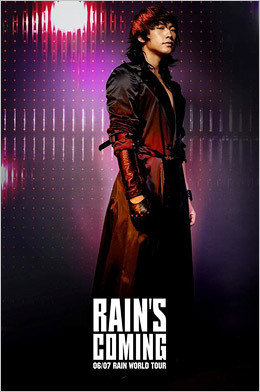 Rain’s World was officially released on Oct 13, and created 100,000 copies of sales record in first day! The figure is still going up indeed. In the meantime, Rain began his publicity activities from MBC SHOW! Music Centre on Oct 14.
doozy: This new album concept of Bi being a some sort of supernatural god/superhero who is going to save the world from death and destruction is… a little over-the-top. And what is with this military theme? He’s trying to expand global, especially into the US music industry, but with the current political situation with the war and all, is this new image/concept going to help or hurt his goals? Appearance-wise, he looks great! I like the new haircut and love the tanned, well-built body. Music-wise, from the several songs that I’ve heard, it’s okay. 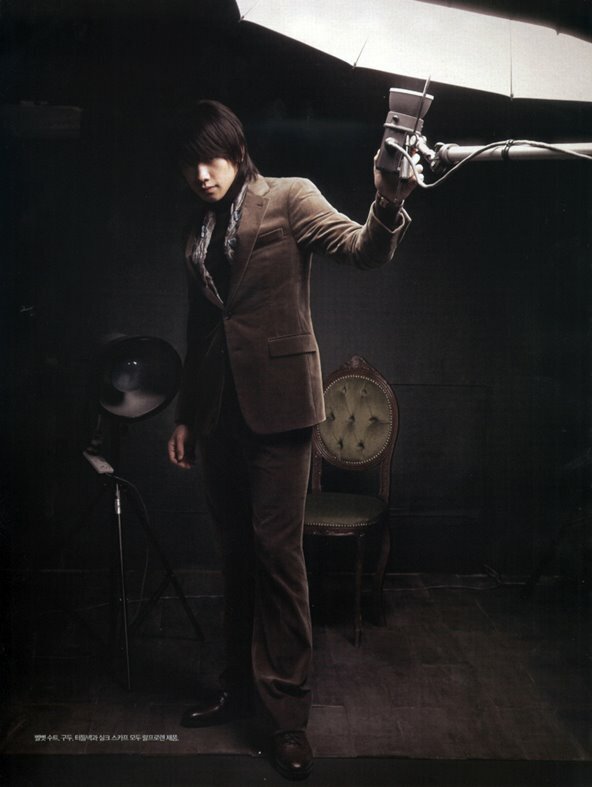 I prefer “It’s Raining” over “I’m Coming.” Although “Move On” is a good song, I still like his previous albums more. Hallyu stars Rain, Won Bin, Kang Dong-won, Suae and Han Chae-young will set up a joint sales office at the 11th Pusan International Film Festival. Star-J Entertainment said October 11 that four talent management agencies that manage big hallyu stars, including JYP Entertainment, Dream East On and The Man, will set up a joint sales office at the festival. The Asian Film Market, which will debut this year, will create opportunities to share information about popular actors aside from just buying and selling films. Influential talent management agencies from both Korea and abroad are expected to install booths at the festival to promote their actors. A person from Star-J Entertainment said that promotional activities of hallyu stars overseas that were unofficially held so far had multiple negative effects, but this event will hopefully pave the way for official and transparent business. The sales office will be open October 15 through 18. It looks like at any moment the pink T-shirt holding in his bulging muscles will be able to contain him no more: shoulders that look as if they have spread another 10 cm in the last year from a new and deeper confidence in his words and ways. K-Pop’s brightest star Rain, who will kick off a world tour at a release event for his fourth album at the main stadium at the Jamsil Olympic Stadium on Oct. 13., agreed to a chat with the Chosun Ilbo. After wrapping up his Madison Square Garden concert back in February, Rain had two choices. There was the perhaps too hasty fast track: putting together an album in English and heading guns blazing into the U.S. market. And the slower and surer option: heading back to Asia to cement his popularity with a world tour first. He went with the second option. 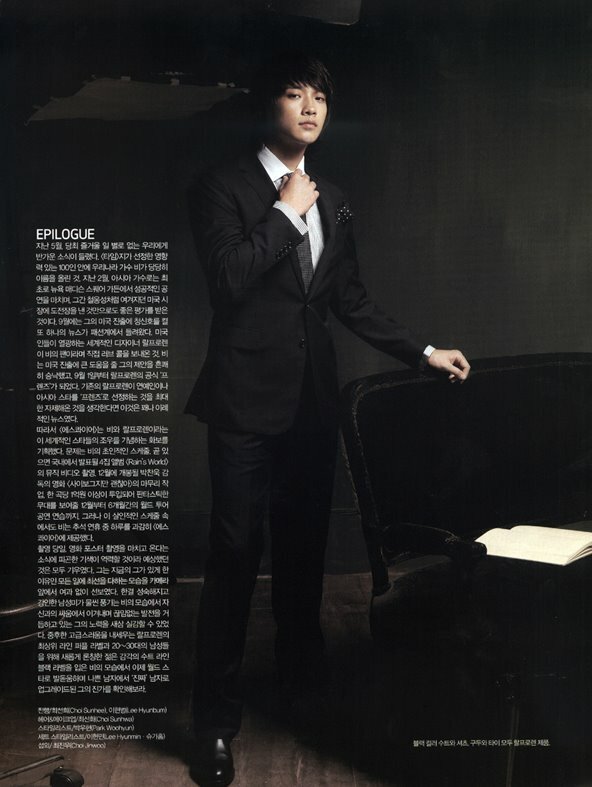 “I thought that the first order of business should be giving a big gift back to the audiences in Asia. Towards the end of next year, I’ll officially release an album in English, and then I’d better get up on those Billboard Charts,” he says. 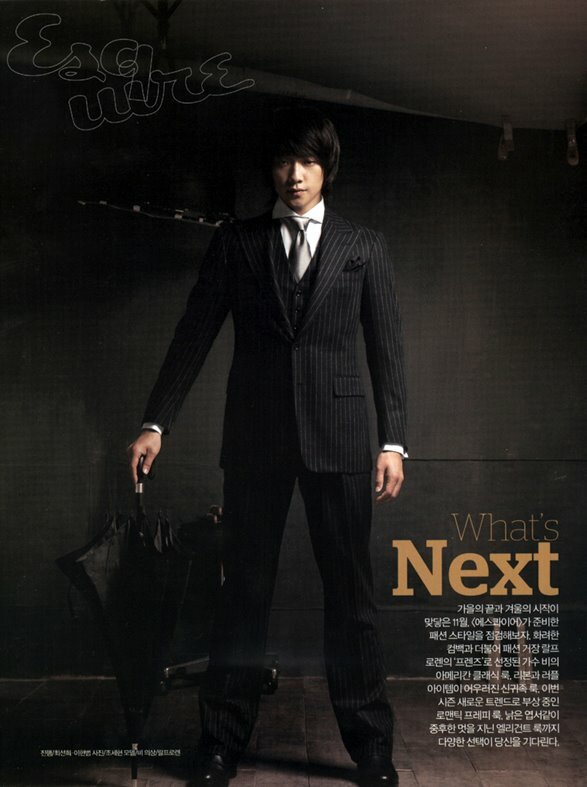 Rain’s ambitions as an actor are not too modest either. He recently finished work on the latest film by director Park Chan-wook, Cyborg Girl. In the midst of all that, he has also been putting together his fourth album and preparing for the tour, putting his daily schedule a long way from comfort. “I sleep for one or two hours,” he admits. The album, to be released at the event on 13th, has his fans all over the world on pins and needles. “In places that have been ravaged by war and starvation, the falling Rain brings the sprouts of peace and love,” is the theme that was chosen to base the album around, explains the singer. In August last year, Rain donated enough to have 50 wells built in Kampot, Cambodia. “It was such a small thing, but many people helped, so we had good results.” Recalling the Time 100 party last May, where the singer rubbed shoulders with some real big-timers, he says, “I was introduced with the phrase, ‘In North Korea there’s Kim Jong-il, in South Korea there’s Rain,’ and I was together with Condoleezza Rice and Jerry Bruckheimer, it was like a fantastic dream. I was infused with a new energy when I returned home.” Back in my days as a dancer, whenever things became overwhelming, I used to head up Mt. Namsan, he says, closing his eyes.